A few months ago, we introduced the new Search Console. Here are some updates on how it's progressing. One of our most common user requests in Search Console is for more details on how Google Search sees a specific URL. We listened, and today we've started launching a new tool, “URL inspection,” to provide these details so Search becomes more transparent. 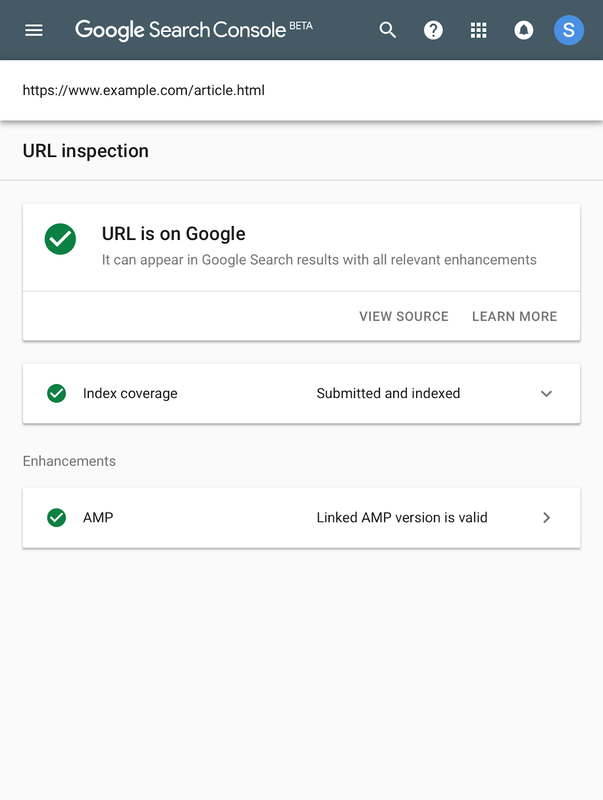 The URL Inspection tool provides detailed crawl, index, and serving information about your pages, directly from the Google index. Enter a URL that you own to learn the last crawl date and status, any crawling or indexing errors, and the canonical URL for that page. 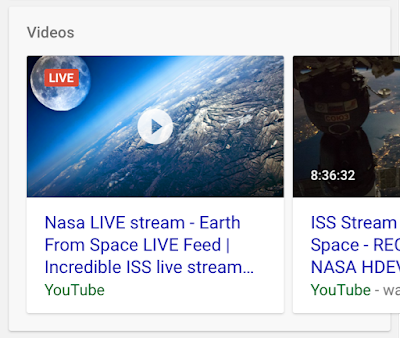 If the page was successfully indexed, you can see information and status about any enhancements we found on the page, such as linked AMP version or rich results like Recipes and Jobs. If a page isn't indexed, you can learn why. 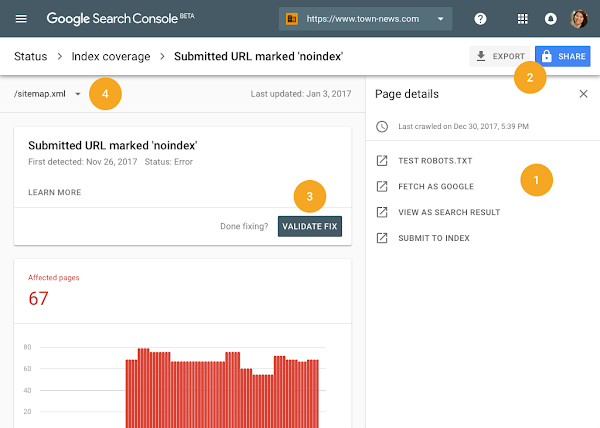 The new report includes information about noindex robots meta tags and Google's canonical URL for the page. A single click can take you to the issue report showing all other pages affected by the same issue to help you track down and fix common bugs. 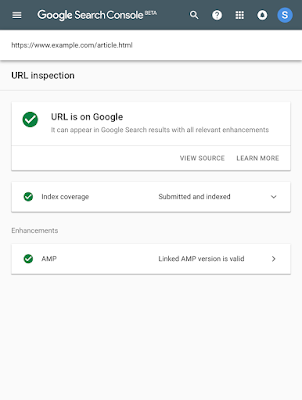 We hope that the URL Inspection tool will help you debug issues with new or existing pages in the Google Index. We began rolling it out today; it will become available to all users in the coming weeks. Sixteen months of traffic data: The Search Analytics API now returns 16 months of data, just like the Performance report. 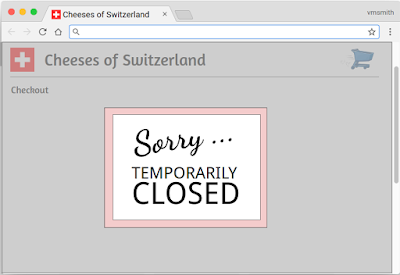 Recipe report: The Recipe report help you fix structured data issues affecting recipes rich results. Use our task-oriented interface to test and validate your fixes; we will keep you informed on your progress using messages. New Search Appearance filters in Search Analytics: The performance report now gives you more visibility on new search appearance results, including Web Light and Google Play Instant results. We are constantly reading your feedback, conducting surveys, and monitoring usage statistics of the new Search Console. We are happy to see so many of you using the new issue validation flow in Index Coverage and the AMP report. We notice that issues tend to get fixed quicker when you use these tools. We also see that you appreciate the updates on the validation process that we provide by email or on the validation details page. We want to thank everyone who provided feedback: it has helped us improve our flows and fix bugs on our side. 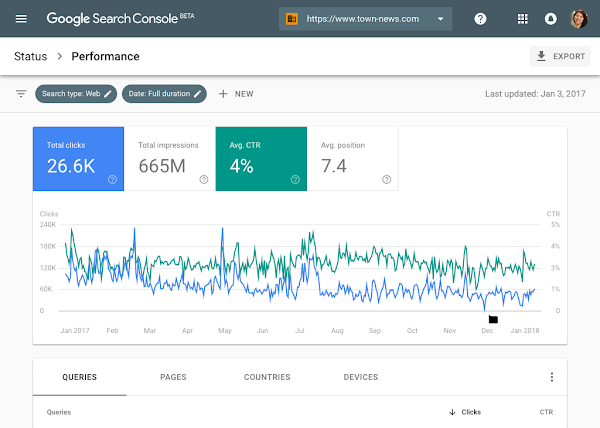 The new Search Console is still beta, but it's adding features and reports every month. Please keep sharing your feedback through the various channels and let us know how we're doing. 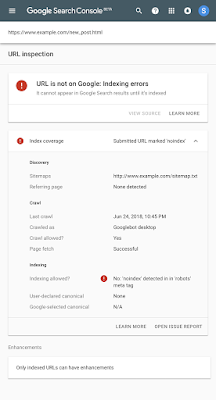 This entry was posted in Google Webmaster Central Blog and tagged crawling and indexing, rich results, search console, webmaster tools on June 25, 2018 by Google Webmaster Central. 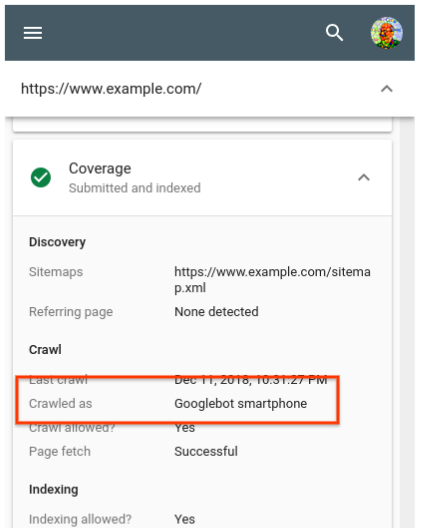 This entry was posted in Google Webmaster Central Blog and tagged crawling and indexing, mobile, Responsive Web Design on March 26, 2018 by Google Webmaster Central. 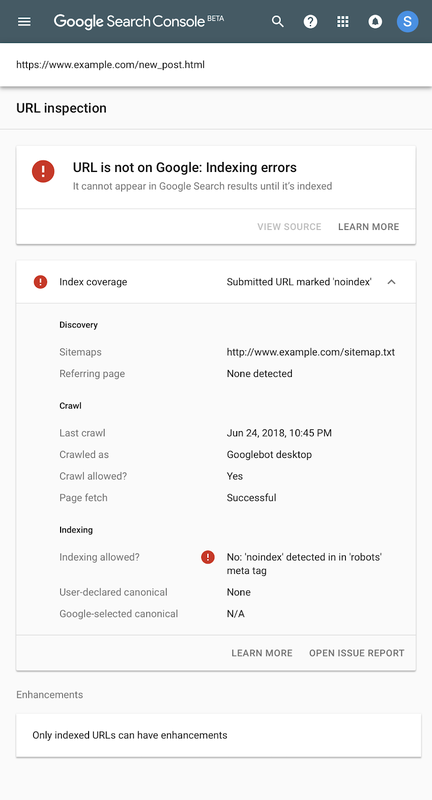 This entry was posted in Google Webmaster Central Blog and tagged crawling and indexing, products and services, search console, search queries, sitemaps, webmaster tools on January 8, 2018 by Google Webmaster Central. Even in today's "always-on" world, sometimes businesses want to take a break. There are times when even their online presence needs to be paused. 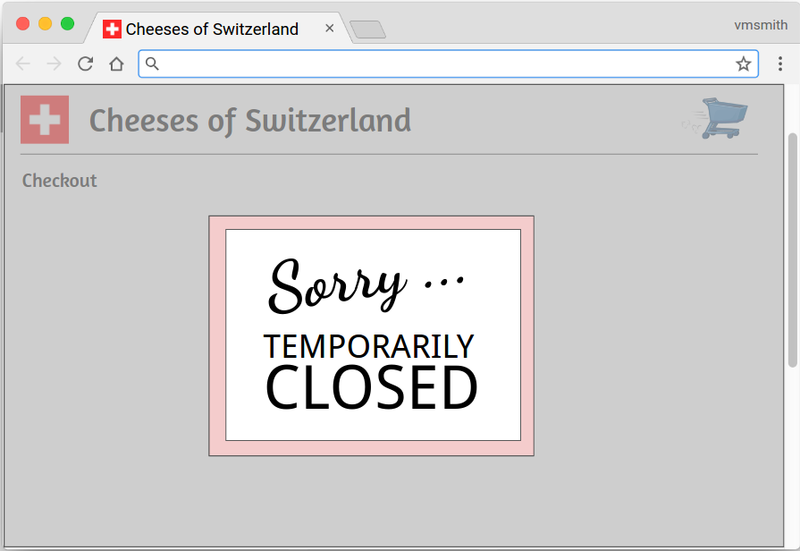 This blog post covers some of the available options so that a site's search presence isn't affected. We hope these options cover the common situations where you'd need to disable your website temporarily. If you have any questions, feel free to drop by our webmaster help forums! This entry was posted in Google Webmaster Central Blog and tagged crawling and indexing, search results, UX on February 28, 2017 by Google Webmaster Central. We won't be using the feature-phone user-agents for crawling for search going forward. 2. Use "handheld" link annotations for dynamic serving of feature-phone content. This is a change from our previous guidance of only using the "vary: user-agent" HTTP header. We've updated our documentation on making feature-phone pages accordingly. We hope adding this link element is possible on your side, and thank you for your help in this regard. We'll continue to show feature-phone URLs in search when we can recognize them, and when they're appropriate for users. We've worked to make these changes as minimal as possible. Most websites don't serve feature-phone content, and wouldn't be affected. If your site has been providing feature-phone content, we thank you for your help in bringing the Internet to feature-phone users worldwide! This entry was posted in Google Webmaster Central Blog and tagged advanced, crawling and indexing, mobile on November 30, 2016 by Google Webmaster Central.